Hardside and Softside waterbeds using them with a current bed frame? Can I use a waterbed on my current bed frame? Many people have purchased waterbeds since their beginnings in the early 1970’s and over the years the old clunky 1970’s water beds have evolved into something that can work in any modern bedroom décor. So how can I use a waterbed on my current bed frame? First it depends on what you are defining as your bed frame. The headboard or headboard and foot board by industry definition is not considered the bed frame; they are actually part of the bed itself. Most of us realize that frame stands on the floor and is the supporting structure that the boxspring foundation rests on while raising the mattress up off the floor. It also supports the foundation or boxspring portion of the set. However hardside waterbeds do not have box springs and because they have different dimensions will NOT work on your current bed frame. 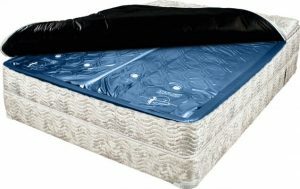 Softside waterbeds the kind that looks like a regular bed offers waterbed owners the ability to use their current bed and room set. Softside waterbeds: the modern waterbed that fits regular beds? Softsides sides were designed in the image of a traditional mattress set even using the exact width and length measurements making them a perfect fit for any regular bed. There is an Important NOTE HERE. While they can be used with nearly any bed, the fact is most of these beds cannot support the extreme weight of a waterbed plus the weight of an adult couple. Frame companies make special frames to support the weight of a softsided waterbed while adapting to a regular bed. What kind of frame will work with both my waterbed and bed? Note: All of the following frames not only work for waterbeds but heavier plus size people. If you have a bed with hook in side rails that are wood and are 8-11 inches off the floor we recommend a complete 4 bar set of BB8K for king size beds with 12 feet or a 4 bar set of BB8Q center support bars with 8 feet for a queen. These are made by Glideaway. Both will screw in and take the place of old wood slats. The weight distribution is ideal for the extra applied pressures of a softside waterbed and when properly installed will keep side rails from cracking and splitting out or damaging the bed. If your bed has steel hook in side rails at head and foot ends of the bed, a 63CSWB for queen with 9 legs and a K83 with 9 legs is the is a great choice for perfect waterbed support. 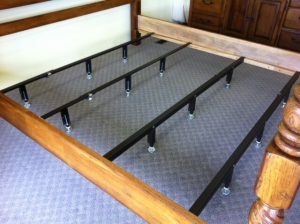 The best bolt up type frame with headboard only connections while supporting the weight of a waterbed or even larger people for that matter is Glideaways Queen Q33 WB and their King K43 WB with 9 feet on both models. All of the waterbed weight is applied to the bed frame while securing a bolt up headboard in a solid position.